Agent Referral Bonuses have been the subject of many industry controversies, ranging from the multi-level pyramids to the popular flat-fee reward. In line with their business goals of changing the Real Estate industry, Avanti Way has found a great formula that rewards in a fair and transparent way while automating the payment process and providing on demand accountability. Sponsor agents are given the ability to track the closings and progress of their sponsored teams on demand and right online. Since its inception in 2006, Avanti Way has grown exponentially and 90% of that growth has been powered by word of mouth: happy agents telling other agents about the new way to work in Real Estate. But the company hadn’t found the right formula for rewarding agents who spread the word, until now. This formula harnesses the power of Technology to create fair and automatic residuals for life. “One of the greatest things I love about working with AVEX is the transparency with which we can handle transactions. Everyone from the mortgage broker, the title company to the seller and the buyer are given access to the transaction with their own private portal, and everyone plays on level ground.” Explains Enrique Teran, Co-Founder and Managing Director of Avanti Way. “We wanted to create that same level of transparency with the Agent Sponsorship Referral Program." AVEX is Avanti Way's proprietary, paperless system that allows their agents to access everything from contracts, transactions, listings and leads from anywhere in the world. To be completely transparent, the process includes three steps: First, the referred agent is made aware that a Referral Program exists and that the referring agent or “Sponsor Agent” will receive a percentage of the referred agent’s commission, paid out from Avanti Way’s profits. Next, the referring agent is inputted into AVEX as the new agent’s “Sponsor”. The proprietary software will then track all of the new agent’s transactions and automatically issue residual checks every time the referred agent closes, for as long as both agents are with the company. Lastly, sponsor agents are given the ability to track the closings and progress of their sponsored teams on demand and right online. Unlike other agent referral programs out there, Avanti Way’s program is easy to understand with no multi-levels and only one sponsor agent per new recruit. Just last month, Avanti Way launched their own Facebook App which agents can customize right through AVEX, and more changes are expected once the new Facebook Timeline goes live on March 30th, 2012. For more information about this and other topics about Avanti Way Realty and this topic, please call 305-229-1146 and ask for Gloria Rodriguez de los Reyes. 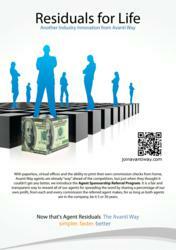 You can also email gloria(at)avantiway(dot)com or visit their agent site: http://www.joinvantiway.com.